McMurray holds one menhaden caught in Long Island Sound. To avoid predators, menhaden will ball into large groups. For fishermen, that can make catching the fish ideal. Now, there’s a movement to preserve this vital species, not just for the fishermen who catch it, but for animals that eat it. John McMurray said he doesn’t really believe in reincarnation. But if it’s true, the charter boat captain joked he’s probably going to come back as a bunker. “Kind of fast growing, short-lived species. Things that are, frankly put on this earth so that other things can eat them,” McMurray said. Bunker are eaten by all sorts of predators: ospreys, tuna, and sometimes, something a bit bigger. John McMurray tosses a net into Long Island Sound. He was demonstrating one way to catch menhaden, or bunker, which he uses as a fishing lure. 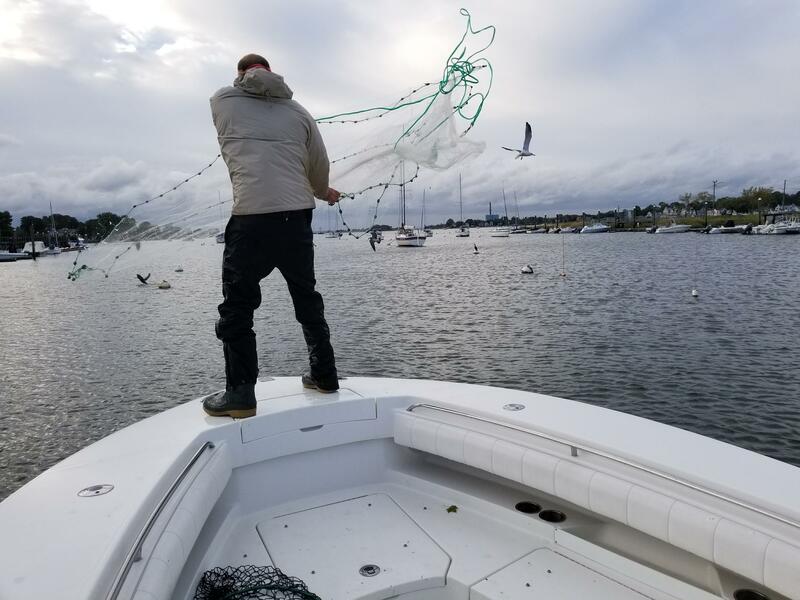 On a recent rainy morning on Long Island Sound, McMurray hopped on a boat to look for menhaden. As he pulled out of the Norwalk Cove Marina, captain Cory Crochetiere explained what to look for. Or pops -- little dimples on the water. After spotting a few, Crochetiere drives toward them. McMurray tossed in a net and quickly hauled it up. Dozens of bunker spilled onto the deck. Menhaden, also called bunker, spill across the deck of a boat in Long Island Sound. This vital fish is now the subject of a new fisheries management decision. But menhaden harvests weren't always like this. Joseph Gordon is with the Pew Charitable Trusts and was also on the boat. “Up until 2012, there was no coast-wide limit on this fish at all,” Gordon said. And all that fishing had an impact, he said. So in 2012 an interstate compact called the Atlantic States Marine Fisheries Commission took action. It set a cap on the coast-wide harvest of menhaden. “Before, the harvest had been fairly unrestricted. 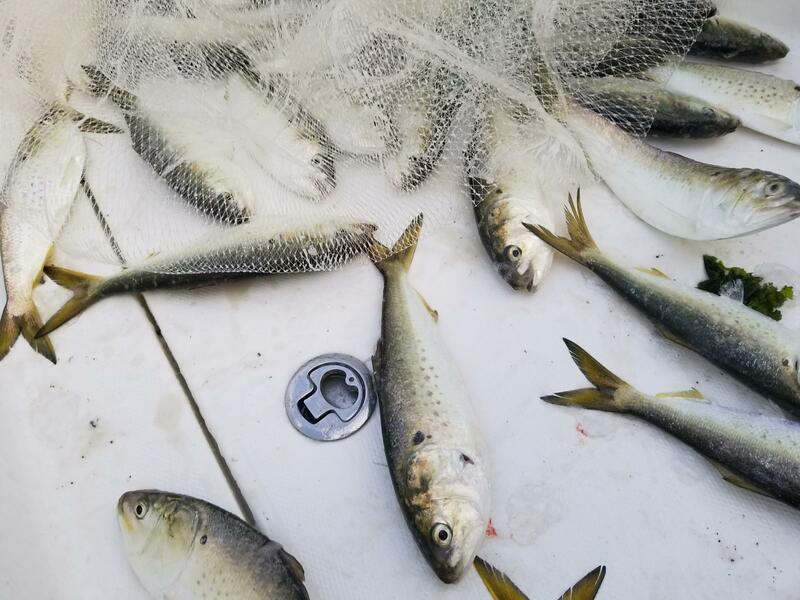 So that was a really big shift in how we manage menhaden,” said Megan Ware, a fishery management plan coordinator with the commission. It’s now looking at another shift in how the fishery is managed. “Menhaden serve as prey for lots of different predator species. And so this will look at not only the abundance of menhaden, but also the abundance of other predator species,” Ware said. Cory Crochetiere said the 2012 coast-wide catch cap worked. And he hopes that, if passed, new limitations would too. Crochetiere said he hopes menhaden stay abundant. For the environment, sure, but also for his business selling fishing boats. Because, he said if he’s got a great fishery in the area, that’s more people that want to go out and fish. Is This Invasive Shrub A Deer Tick Haven? What started as one scientist's hunch turned into a decade of research, which now claims a positive link between an invasive shrub called Japanese barberry and deer ticks.